Figure 3 (A) Combined volumetric and surface rendering of a CT scan of the thorax of a 19-year-old woman with postpneumonectomy syndrome. The right and left sides are inverted as though one is viewing the airway in a simulated bronchoscopy. The right lung was resected and mediastinum has shifted to the right. The left bronchus (arrow) is compressed between the transverse aorta and the spine. 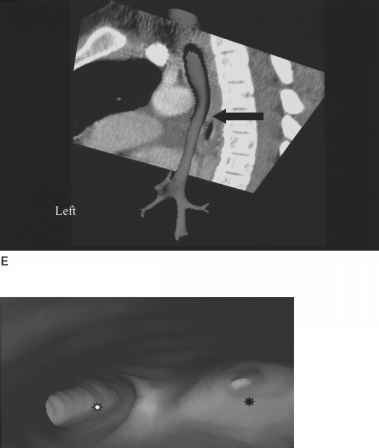 (B) Surface-rendered 3D reconstruction of the trachea with superimposed axial planar image shows narrowing of the 3D bronchus (arrow) between the aorta (star) and spine. 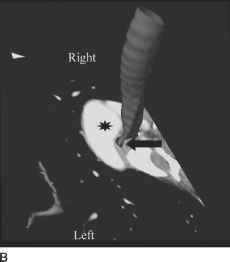 (C) Three-dimensional reconstruction of the trachea with superimposed sagittal planar image shows narrowing (arrow) of the 3D left bronchus between the aorta (star) and spine from a different perspective. 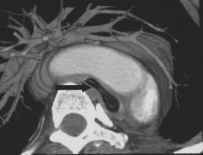 (D) Volumetric rendering of the postoperative CT scan after repair. The right pneumonectomy space is filled (octagon) and the mediastinum is repositioned to the middle of the thorax. 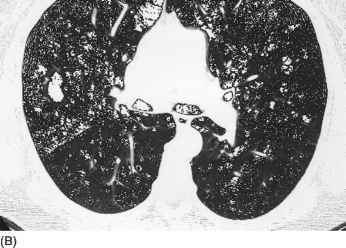 The intraluminal caliber of the left bronchus (arrow) increased from 4 to 8 mm in diameter (star marks the aorta). 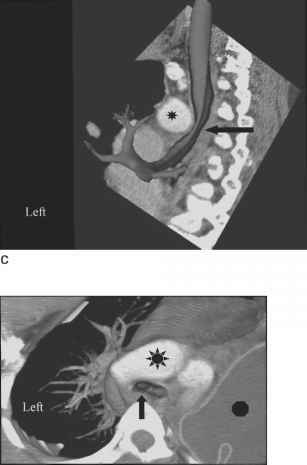 (E) A three-dimensional reconstruction of the postoperative airway with superimposed sagittal planar image shows improvement of left bronchial narrowing (arrow). (F) Virtual bron-choscopy view of the airways at the level of the distal carina. The right bronchus (black star) narrows consistent with resection. The left bronchus (white star) appears normal in caliber. Figure 3 Continued surrounding the three-dimensional airway. One of the disadvantages of surface-rendering is the need to set the proper window and level threshold for the program to create its 3D structure. If the window and level are slightly off, the tracheal wall may appear discontinuous or fragmented and small or stenotic airways may not be properly reconstructed. struction of the entire thorax from the CT data (Fig. 3). This technique does not depend on adjusting the threshold window and level prior to creating the images. The lumen of the trachea and bronchi is naturally constructed as a hollow column of air within the soft tissue volumetric dataset of the mediastinum. Unlike the surface-rendering algorithm, the airway is not a freestanding three-dimensional structure but is ''embedded'' in the three-dimensional mediastinum. Because images are created from standard CT images, the 3D structure needs to be rotated 180° to invert the left and right. This inversion is necessary in order for the viewer to visualize the airway as though one is truly performing bronchoscopy. Real-time fly-through is not available for this type of reconstruction at this time. A simulated fly-through of the airway can still be performed by the viewer, however, by manually selecting a travel path and replaying this path through a movie loop. Commercial programs, which create VB using either of these algorithms, can be installed on independent work stations in the radiology department. Volume-rendering programs have the advantage of reconstructing multiaxial data sets from any part of the body into three-dimensional and multiplanar imaging. Such programs provide flexibility in the clinical radiology practice and can be applied to imaging of the brain, vasculature, and solid and hollow organs.